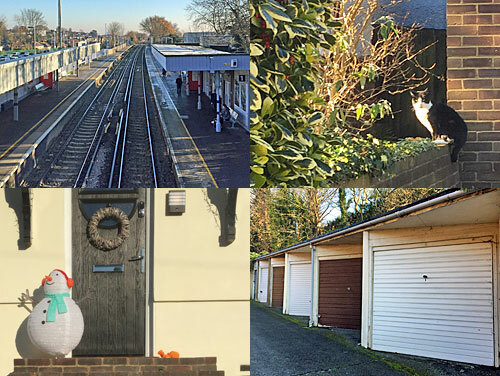 The modern borough of Bexley is a four-way amalgam - the Municipal Borough of Bexley, the Municipal borough of Erith, Crayford Urban District and as much of Chislehurst and Sidcup Urban District as lay north of the A20. All were previously in Kent, which has inspired 50 years of tedious nominative argument we'll not delve into here. But there's no doubt Bexley still feels somewhat disconnected, even unexplored, so I thought it would be a great place to go for a random walk. Psychogeographers love a good dérive. A dérive is "an unplanned journey through a landscape, usually urban, in which participants let themselves be drawn by the attractions of the terrain and the encounters they find there". It comes from the French word for 'drift', the same language that gave us flâneur, meaning 'one who wanders aimlessly'. But it's quite tricky to drop one's expectations and freewheel, so what's often needed is a strategy to aid unbiased exploration. You could flip a coin at each junction, you could draw a straight line on a map and try to follow it, or choose to only walk downhill. As a reader of this blog, I'd hope you've flâneured at least once. 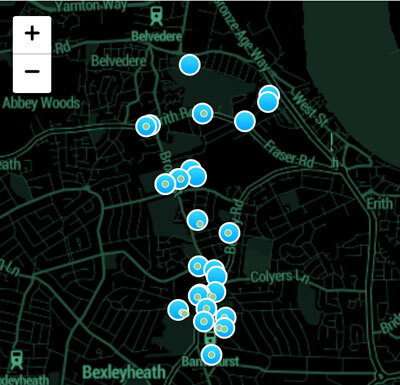 To aid me in my drift around Bexley I used an app called Dérive, which deals a pack of virtual 'task cards' to direct users around an urban landscape. Every time you need a new challenge you press for another card, read the instruction and off you go. The app even takes note of time and distance, and generates a map so you can see where you've been. The app's small, and free, and has been updated to a new improved version only this week. If you ever have an hour to spare in an unfamiliar location, or even half an hour closer to home, you too could give Dérive a try. I selected a base deck of general urban tasks and combined these with a specific set for London, let the app do the shuffling, and set out. For my starting point I picked the point where the three boroughs of Bexley, Crayford and Erith originally met, which it turned out is on the edge of Northumberland Heath. Annoyingly the precise spot is at the bottom of the garden of number 20 Courtleet Drive, a residential cul-de-sac off the Erith Road, and therefore inaccessible. So I stood outside the front garden, attempting not to look in any way suspicious, fired up the app and began. Find a dustbin. Well that's easy. Even better, my first success is the bin outside 20 Courtleet Drive. Stroll. Greet a passing stranger. Take a photo of their shoes. Apologise and continue. Ah. Some of these cards require actual interaction with your environment, and this instruction demands more interaction than most. I head up to the main road and soon pass a middle-aged gentleman, somewhat grumpy-looking, and fail to carry out the full sequence of three. I do grunt "morning", and he ignores me. I do snap an awkwardly surreptitious shot of his sensible black trainers, but I decide against following up with an apology because that would only make things worse. Look for some trash on the street. If it's moving, follow it. I meet a fox sitting brazenly on the pavement at the top of Doris Avenue, but I guess that's not the kind of trash intended. A squashed Coke can suffices instead. Find silence. Oh now that's a good challenge. Even though this is Bexley on a weekday, the backstreets are never entirely quiet. A slammed car door. The postman on his rounds. A beer barrel thumped off a lorry outside The Brewers Arms. Jetwash. A Mercedes being pushed onto the back of a breakdown truck. Aeroplanes overhead. Numerous birds. Eventually I work out that Burstead Wood offers the best opportunity for peace, so head there. It is an absolutely glorious winter's day in the park, and absolutely nobody is here but me. The sound of scrunchy leaves fades away as I stop walking. Perfect silence. Identify a group of people. Walk towards them and loiter around for a bit. This must be dead easy in the centre of the city, but it proves much harder in the Bexley suburbs. Most people drive. Only singletons are out walking. The bus shelters are recently emptied. I walk towards the shopping parade in Barnehurst, but even this retail hub can't generate a 'group' of any description. I blame the large billboard beside the computer repair shop which urges locals to go to Bluewater instead. In the end I resort to visiting the station, where a group of glum hooded figures with hands in pockets await the Victoria train. I loiter until they depart. Find a cat. The best place to spot a cat must surely be a residential street, so I head to the adjacent warren of commuterbelt avenues. Up the fourth avenue I think I spot a cat crossing the top of the hill, so hike up, and there's a black and white tabby perched on a wall behind the hollybush at number 15. Tick. Turn around. I was hoping to continue up the hill, but I'm not in charge here, the app is, so I turn around. Walk towards the heart of the city. If there's no heart, conjure one up. That'll be west, then. And Grasmere Road has plenty of heart, in the form of wreaths on doors, a jolly snowman on one front step and an illuminated polar bear on another. Find graffiti or tagging. 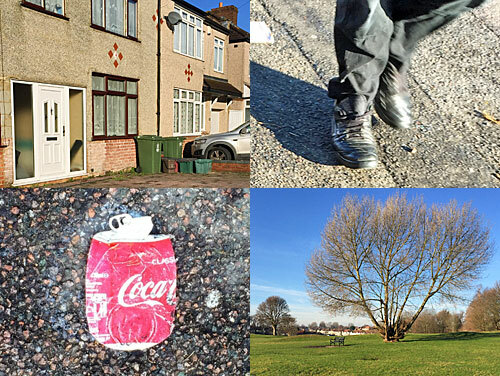 In most inner London locations this would be easy, but this is Bexley and surfaces are generally pristine. I even find a row of ten garages behind some flats, and am amazed to see that their doors are clear - pure white, pure brown - until finally the tenth has a splash of faded tagging above the handle. Memo, whoever you are, much respect. Follow a green vehicle. I soon confirm that green cars are vastly outnumbered by their duller-coloured counterparts. I stand at the fiveway junction in Northumberland Heath, breathing in the sweet smell of baked goods, for at least five minutes before anything appropriately emerald goes by. And that's why I exit via Brook Street, one of the only roads across the original heath, long built-over. Alternate between lefts and rights until you find something that's framed. Left, past one of Bexley's rare tower blocks. Right, towards Londis at the back of the Pheasant Garage. Left, past the recently boarded-up Pheasant pub. 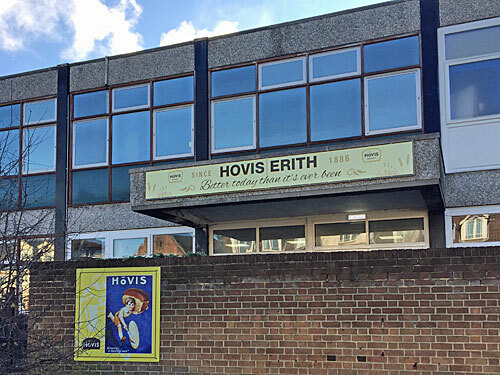 Hey presto, I've arrived at the source of that gorgeous smell, Erith's Hovis bakery, a huge industrial affair running down to the back of Courtleet Drive. And ahh, framed on the wall outside is a child rolling a hoop with a huge loaf of wholemeal on his shoulder. "Hovis ensures a healthy race." My random walk is finally delivering the goods. Look for someone wearing red shoes. Take notes and directly afterwards, take the 1st left. I'm hopeful, because red trainers are definitely in vogue at present. But not during schooltime, not in winter, and today everyone's in white or black. I ply the entirety of Northumberland Heath's shopping parade, an extensive beast, and the best I can come up with is a pair of purple boots. The Big Issue seller is in brown flats. The Santa Claus in the window of the charity shop is barefoot. Eventually I spot a bloke outside the Utopia Nail Spa with red soles, and he'll have to do. Zigzag from street to street until you find a patch of grass. Horsa Road... Ethelbert Road... Hengist Road... Penda Road... Collindale Avenue... a triangular traffic island with a tree on it. I like how all the streetname signs in Bexley include the logo of a defecating dog rather than the borough's coat of arms. Meander in the direction of a green car. My quest is suddenly starting to feel a bit repetitive. Green cars continue to be distressingly rare. I meander more in hope than expectation, finally spotting one on Brook Road. Meander in the direction of a green car. What? Again? But this time I spot one almost straight away, parked up behind iron gates, windscreen frozen over. 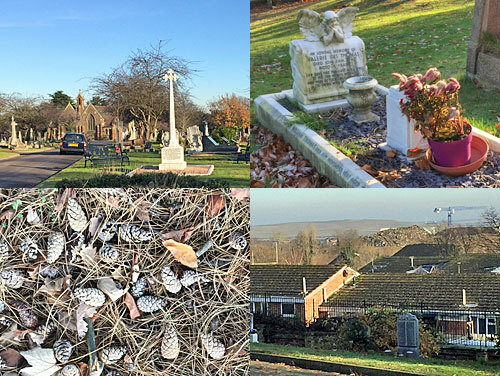 My dérive has delivered me to Erith Cemetery! Pick a flower. Oh that's cruel. Obviously whoever put these cards together had no idea that this one might pop up in a graveyard, but even though it's the one place you're sure to find flowers in winter, there's surely no worse place to pick one. Nobody else is here, other than a stonemason hiding in his van, but seriously, no way. I pass several vases of artificial blooms before reaching the final resting place of Valerie Iris Thomas, died 10th January 1942, aged 4 years. The pot of real pink flowers on her grave has blown over in a recent gale, and looks bereft, so I pick it up and set it right. The app has inspired a good turn after all. Look down for the next 15 steps. Pine needles, pine cones, large brown oak leaf. Find yourself a quiet spot. Contemplate your surroundings and take the busiest exit. In a cemetery, finding a quiet spot isn't difficult. The land falls away sharply beyond the railings, opening up a vista towards rooftops, a pile of spoil in a former quarry topped with cranes, and a heaped-up landfill site on the other side of the Thames. It's strangely pretty. Find a parked sports (or just fancy) car. Walk in the direction its front wheel is pointing. A posh car in Lessness Heath? I'm unconvinced. The app's allowing me freedom of direction so I cross the valley and climb the hill and pass the flats and nothing's looking even vaguely souped up. Thank heavens I reach the soft top Mini Cooper outside Court Lodge seconds before its owner emerges and drives off. Follow a phone user. Here on the main road I'm spoilt for choice - everyone's tapping away. I follow the nearest woman, and only later do I discover I've been stalking a young mother on her way to nursery. I doubt that "blaming the app" would stand up in court. Find an object that's out of place. Continue in the direction the object appears to be facing. Everything on Erith Road (another Erith Road) looks normal, especially the houses, even the fire station. 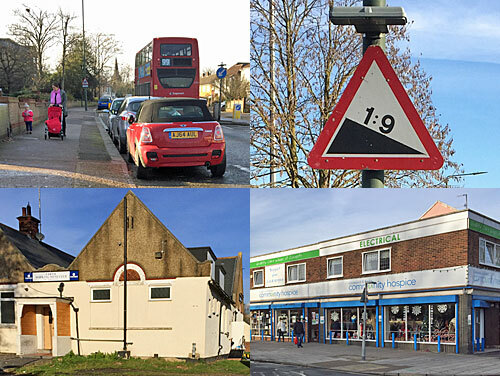 But a steep hill sign still shown as a ratio (1 in 9) is definitely unusual, indeed it's very Bexley. Follow something black. That's too easy. I follow a car from Elaine's Driving School, Erith-ward. Walk north and find something you can draw hope from. Ah, no longer Erith-ward, but heading towards the Thames. I'm expecting to reach St John the Baptist church, one of the oldest buildings in Bexley, but instead halt before the dual carriageway at the lowly pebbledash Erith Working Men's Club. Its back door is open and a working man's knees are sticking out, fag in hand. Another working man drives up in a van and parks outside. There is hope. Turn left in 10 steps. Done. Blimey, this is almost shantytown Bexley up here, with less than sturdy homes crammed in on unadopted roads. Head towards a nearby square of some kind. At the top of the hill is Franks Park, a splendid hump of woodland separating the two residential flanks. It has a former bandstand and a former air raid shelter, and a central panorama of the Thames, but nothing obviously square. I choose to walk down into Belvedere in the hope that its shops are in a square, but Asda and B&Q are too sprawled and the rest too linear. Outside the clothes shop a police officer is giving a full body search to a mouthy man in overalls. Her colleague is checking his van, which has a hockey mask hanging prominently over the front seat. The man is proclaiming his innocence, and giving them a full rundown of recent surgery on his tendons. I'll never top this, I reckon, and decide to end my dérive here. To reveal the true nature of a place, sometimes it's best to have no plans at all.